What is a Practice Day? We hire the track the day before our race meetings so competitors can sort out their bike and get some extra practice. Left over spaces are made available to non-competitors and a link will be put on our Entry Forms page for bookings. Note: this day is run under the same conditions as a Public Ride Day and you can use any bike and equipment that meets those rules, so your bike does not have to be fully race prepared. Places are limited in some Groups so it is advisable to book. If you just turn up at the track hoping for a vacancy, you will have to pay cash. Do you need a Track Licence? 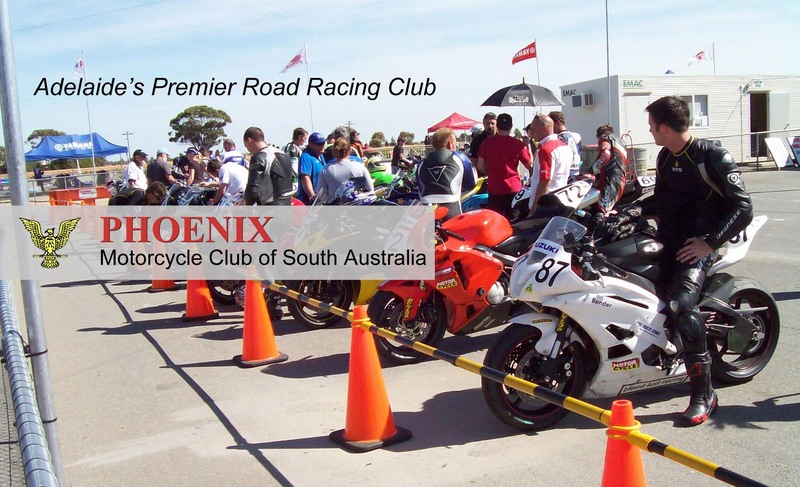 You must have a current Competition or Recreation Licence issued by Motorcycling Australia . If you don’t, you can add a One Day Recreation Licence to your booking. This will be issued at the track when you sign in. Which Group will I be in? Groups are based on speed and experience and run in rotating 15 minute sessions. It is very important that you choose the correct group for your own safety and those around you. However, groups are flexible, so if you are found to be in the wrong group, or riding in a dangerous manner, we will take appropriate action. Mallala: We do not control the Pit Garages, they have to be hired direct from the management of Mallala Motor Sport Park. You can pre-book Pit Garages at (08) 8276 7744 office hours or do it at the track when you arrive. The cost is $75/day* for a 2 bike garage (you can share with a mate) and they accept credit cards. Note: the grassed area at the rear of the garages is free. Avgas, E85 and 98 fuel can be bought at the self serve (credit card) bowser near scrutineering. The Bend: a shared space in a Pit Garage is included in your booking fee. Fuel is available from the On The Run servo next to the track.